Sousanah Ezzat Riad of Cairo spent two months with experts in the MSU Department of Food Science, Nutrition and Health Promotion learning techniques to isolate and identify foodborne pathogens that affect food safety and consumer health. Riad recently completed a Master of Veterinary Science degree at Alexandria University in Egypt in microbiology and is now a veterinarian for the country's government. 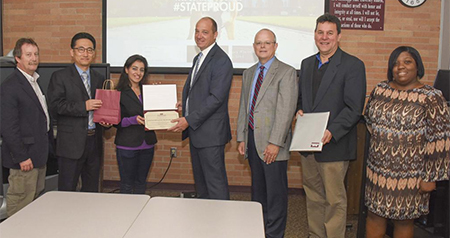 MSU hosted Riad through the U.S. Department of Agriculture Foreign Agricultural Service's Scientific Exchange Scholars Program. This program promotes food security and economic growth by increasing scientific knowledge and collaborative research to improve agricultural productivity. Participants learn new research techniques and gain exposure to scientific developments in various fields of agriculture. They also visit other fully-equipped laboratories and libraries during their stay. Riad's work dealt primarily with the detection of Salmonella, E. coli and Staphylococcus in various food products. "My research focus for my master's degree was in milk products, so I worked exclusively with those," she said. "Here, I got to branch out and apply what I've learned toward other products including fish, meats and poultry to find acids and bacteria while learning some new research techniques that are not familiar in Egypt." Juan Silva, a professor in the Department of Food Science, Nutrition and Health Promotion, and Taejo Kim, an assistant professor in the department and Mississippi Agricultural and Forestry Experiment Station scientist, were mentors for Riad while she studied at MSU. "Our goal was to enhance what she knew and show her new techniques in detecting pathogens using the technology we have in our labs," Silva said. "I gave her some information on the potential problems that stem from the use of raw milk in making products. We gave her some guidance on what we have here, and some of the things we do and don't recommend." Techniques Riad learned at MSU included DNA separation, detection and quantification. Commonly referred to as real-time polymerase chain reaction, the process allows for detecting foodborne pathogens such as Salmonella, Listeria monocytogenes and pathogenic Vibrio bacteria in various foods and their processing environments. "Using real-time and conventional PCR methods, among other biochemical and immune assay techniques, she was able to learn DNA preparation and electrophoresis techniques for detecting the target foodborne pathogens so she could learn more about their characteristics in sensitivity and specificity," Kim said. "These are detection techniques used by scientists with the USDA and U.S. Food and Drug Administration on a regular basis in their research." Jon Rezek, interim associate vice president for international programs at MSU, noted that the university has hosted scholars through this and another USDA scholar program in consecutive semesters. "The process of bringing a rising scientist in another country to MSU through the Scientific Exchange Scholars Program dates back to 2013," Rezek said. "This, along with the Norman E. Borlaug research fellowship, is an extremely competitive program. It was well worth the effort to get Sousanah on the MSU campus. Collaborating with her is a very important part of our mission of strengthening trade relations with other countries." This may not be Riad's last time in Starkville. She is considering is pursuing her doctorate at MSU. "It was a great opportunity to learn about some processes that are used here and to be able to take this information back home and teach it to others there," Riad said. "There are a lot of things I learned that will be helpful for me in my career. I was fortunate to see a large range of research activity here, and I am thankful for the experience."